The Mexican Wolf (Canis lupus baileyi) is the rarest, most genetically distinct subspecies of the Grey Wolf in North America. Until recent times, the Mexican Wolf ranged the Sonoran and Chihuahuan deserts from central Mexico to western Texas, southern New Mexico and central Arizona. 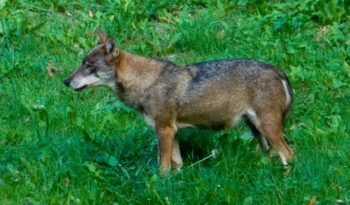 By the the turn of the century, reduction of natural prey like deer and elk caused many Mexican Wolves to begin attacking domestic livestock, which led to intensive efforts by government agencies and individuals to eradicate the Mexican Wolf. Mexican wolves prefer to live in mountain forests, grasslands and shrub lands. 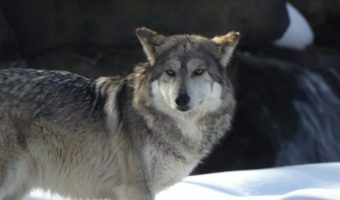 The Mexican Wolf is also one of the smallest subspecies of North American grey wolves, reaching an overall length no greater than 135 centimetres whose maximum height is about 80 centimetres. The Mexican Wolf weight ranges from 27 – 45 kilograms. Mexican Wolves are the most endangered. Commonly referred to as ‘El lobo’, the Mexican wolf is grey with light brown fur on its back. The Mexican Wolves have long legs and a sleek body which enables them to run very fast. 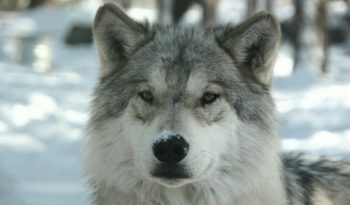 The modeled grey appearance of the Mexican Wolf is excellent as a camouflage in the forested areas. The Mexican Wolf has a superior sense of smell. By traveling in packs, the Mexican Wolf ensures its safety and a higher chance of catching prey. 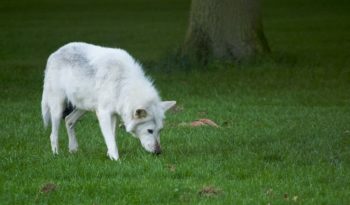 Only the alpha pair in each pack breed each year. This occurs between January (at low latitudes) and April (at higher latitudes). A litter of 6 to 7 pups is born after a gestation period of about 63 days. The pups, which are born blind, are reared in a den composed of a natural hole or burrow. All members of the pack care for the pups, who are fed regurgitated meat after hunts. Pups are weaned at about the fifth week and approach adult size by early winter. By autumn, pups are capable of traveling with the adults and the pack hunts as a unit throughout its territory. Mexican Wolf pups remain with the pack until they reach sexual maturity at about 2 years, after which they may leave to search for a mate and establish new territories, or remain in their pack as helpers. The approximate life span of the Mexican Wolf is 16 years in captivity, rather less in the wild. Mexican wolves prey on white-tailed deer, mule deer and elk, however, they are also known to eat smaller mammals such as rabbits, ground squirrels and mice. Wolves are very social animals. 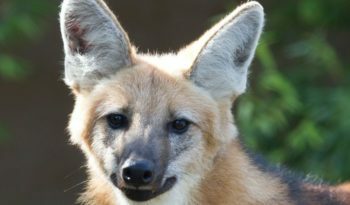 They live in packs, which are complex social structures that include the breeding adult pair (the alpha male and female) and their offspring. A hierarchy of dominant and subordinate animals within the pack help it to work as a unit. (For more information see Wolf Behaviour). Humans and habitat destruction are the only major threats to wolves. In March 1997, the U.S. Secretary of the Interior authorized the U.S. 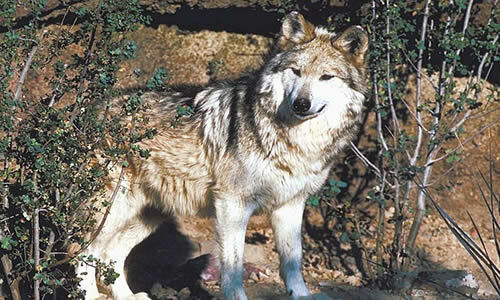 Fish and Wildlife Service to begin reintroducing Mexican Wolves into the Blue Range area of Arizona. The overall objective of this program was to re-establish 100 Mexican Wolves in the Apache and Gila National Forests of Arizona and New Mexico by 2005. This has not been successful and the Mexican Wolf remains a critically endangered species with only 15 or less living in the wild today.